Would it matter if the Earth rotated clockwise? In the Futurama episode "That Darn Katz!" they save the world by rotating the Earth backwards saying it shouldn't matter (which direction Earth rotates). If Earth rotated clockwise and remained in it's current counter-clockwise orbit around the Sun, would it affect anything beyond the direction the constellations move across the sky? Barring whatever fantastic energies would be required to stop the mass of the Earth from rotating and then changing the direction of the rotation, one of the major things I can see changing would be the expectations of weather patterns. 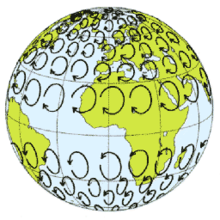 Part of what affects our weather is known as the Coriolis Effect. While there would certainly be effects from the change of the weather from the Coriolis effect how this would change the weather could only be guessed. It is certain to be transformative, and if it were an abrupt change, possibly catastrophic as deserts might move, food crops might be affected, and likely expected storm patterns would be changed. I neglected to think about the effect this would have on our structures which would collapse due to shearing action unless the stopping action included a planetary stasis field. Objects in motion tending to stay in motion and rotation speeds of over 1000 mph and the inconvenient theory of conservation of momentum. I forgot to think about our oceans as well, since the Coriolis effect would change them, too. I also neglected to consider the molten core of the Earth (pesky spinning, geo-magnetic iron). Stopping the rotation of the molten core might cause the magnetic field of the Earth to collapse, allowing the world to be bathed in cosmic radiation (killing every living thing). My assumption was when they stopped the rotation of the Earth and reset it, they would consider having a magnetic field a good thing and would be sure to stop reset the whole thing. Granted, the Earth of the year 3000 may have other advantages which might offset any changes from the altered rotation of the Earth. As a funny idea, it has potential, but the serious ramifications of such a feat boggle the imagination. The day/night cycle is the first obvious effect: Days and nights would both be longer (EDIT Or shorter, apparently I got it backwards) if the speed of rotation is the same. All life on the surface of the planet has evolved for day/night cycles of roughly the length we experience now, with leeway for the difference between summer and winter. A sudden change is likely to affect the health and/or sanity of most species on the planet, although it may not be apparent at first. The planet's rotation and the tides are also connected, as noted by Thaddeus in his answer. If one is affected, the other is likely to be as well. Again, I'm not a physicist, so it's difficult to theorize the net effect. Both the change in sunlight and the possible change in the tides would affect coral reefs, which seem to be sensitive to both. If the change is bad enough, the effects could bubble up to mass extinctions in the ocean. Don't forget, you're also screwing with the molten core of the planet. If you make the surface spin one way, and the core slows down, our Magnetosphere could break down entirely, which allows the solar wind to just blow away the ozone layer - and if that happens, the surface of the planet would be exposed to extremely dangerous levels of UV radiation, causing mass extinctions. A change in the direction in which the Earth rotates would cause a heap of changes. 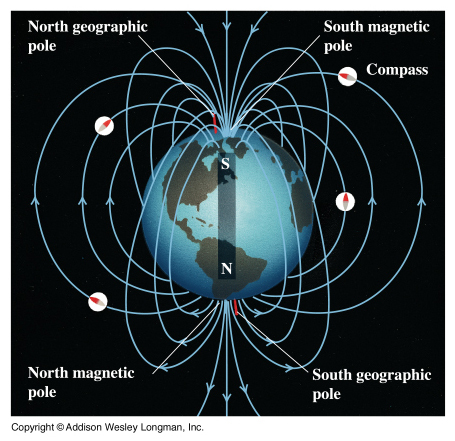 The magnetic field (or the geomagnetic field) generated by the motion of the molten iron alloys in the Earth's outer core would flip poles, meaning the magnetic north pole and the magnetic south pole would 'switch'. The Earth uses its geomagnetic field as its means of protection from solar winds (energetic charged particles emanating from the Sun). With a change in the geomagnetic field, Earth's defense to these solar winds may be hindered. If solar winds were permitted to reach Earth, they would strip away the ozone layer and expose Earth to harmful UV rays. Furthermore, the vast majority of technology now-a-days utilizes these magnetic fields and a change in these would shut technology down (what would we ever do...). Also the Coriolis effect would be thrown way off kilt. This would cause dramatic changes in weather and possibly natural disasters in areas in which they are not common to. Hope this answers your question. The big change in my opinion would be the geomagnetic field 'switch'. This could lead to mass extinctions for many species. opposite to direction of Earth orbiting Sun. Since earth spins in same direction as orbits the sun we lose one day in year. If we flip rotation of earth then instead loosing extra day we gain one. So year would have 367 days or you can say that day would be shorter by 2*24/366 hours (almost 8 minutes). This has also impact on tides. opposite to direction of Moon orbiting Earth. Here interesting stuff happens. Moon orbits Earth in same direction as Earth spins as result we have tides. Tides are experience a drag, so as an outcome speed of earth is being reduces. To sustain angular momentum Moons gains energy and increases distance to Earth (at the beginning of Earth and Moon history day was 4 hours long and Moon was much closer). Now when we flip spin of Earth is opposite to Moon orbiting, same drag created by tides slowdowns Earth spin and drains energy from Moon. This will cause Moon to reduce distance to Earth and finally collide with Earth. I disagree with concept that direction change of Earth rotation would swap magnetic poles. Please note that Earth magnetic field is far from being constant. As geological record shows magnetic poles flipped many times in irregular intervals. It is very chaotic, so saying that alternative rotation of earth would lead to swapping of magnetic field is hard/impossible to prove. IMHO it is naive assumption. I wouldn't DIRECTLY matter, because the rotation affects our weight mainly - as long as it was rotating at the same speed, we wouldn't see a difference. However, as per @Thaddeus, the INDIRECT effects would be substantial. The major and minor weather systems would be completely disrupted, as would the major ocean currents. This would change the weather systems for the whole world ( not least in the UK, where I am, because we rely on the Jet stream and the Gulf stream ). The difficulty with predicting what would happen is that these systems have developed over millenia, and we have no idea how long they would take to redevelop based on a different spin. Or what they would develop as. Additionally, some of the land-forms have been shaped by these systems. It is possible that parts of Europe might be drowned by a change, or erode away at an untenable rate. Or that huge tracts of sea-bed would become land as they silted up. The maps of the world would, without doubt, change. Another issue is how quickly the change would occur. If it was not done instantaneously, as the rotation was slowed, people and things would become significantly heavier. There would be building collapse, as they could no longer support their own weight. What is more, as the weather systems slowly changed with the rotational shift, we may well slip into an ice age or a baked age, or even a water age. The weight change would also affect the ice packs, not to mention the actual land masses themselves. The Himalayas would weigh considerably more, and so push against the continental upshift. For those of us who don't enjoy reading huge long responses, the short answer would be, a change in weather patterns, polarity change, and possibly backwards seasons? Direction of earth rotation is not scientifically defined. It is culture thing since at some point we have decided that north pole is "the top of the word". This is just convenient establishment. From scientific point of view both poles are equivalent so direction of rotation counter-clockwise or clockwise are undefined. Same refers to direction of orbiting the sun. Only speed of rotation matters and earth is slowing down. At the beginning of earth day had 4 hours length. So question "Would it matter if the Earth rotated clockwise?" has no sense. Th good question is: what if earth would rotate in opposite direction to orbital rotation? It would have impact on day length (2*24/365 hours shorter day) and on tides (and sky movements). That's it. Coriolis Effect would remain unchanged (just flipped). It has been tested and proven that if the Earth is forced to rotate in the opposite direction, then time will be forced to move backwards. Not the answer you're looking for? 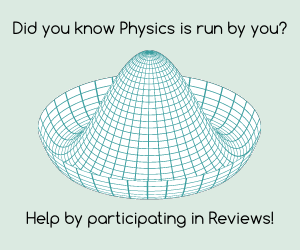 Browse other questions tagged astronomy rotation earth or ask your own question. What will happen if rotation of Earth will get reverse? What cosmic event would cause Sun rising from the west? If the earth would stop spinning, what would happen? If the Earth didn't rotate, how would a Foucault pendulum work? On what planar regions are the Earth, Moon.. for that matter, all astronomical bodies, placed in the Universe? Direction of CMB and magnetic fields? Why does earth spin counter-clockwise? What force is needed to turn the Earth Pole-over Pole. Eg. UK now on Equator? How does Earth rotate on its axis, clockwise or anti-clockwise?